Since being part of our new group on Facebook African American Genealogy & Slave Ancestry Research there has been a lot of Resources that has been passed through the group. One of the members posted a link to Alabama Estate files. I knew that I had Alabama Roots so I decided to dig in and see what I could find. As I was looking I realized that my Ancestors County(Mooresville, Limestone, County) was not listed, but I decided to look for their name in each County that was listed anyway. As I was going through the information, I realized that I didn't know who or what I was looking for, but my PEEBLES Ancestors spoke up and I listened. They took me in a whole different direction. The name PEEBLES is such a rare name so looking for any information would be simple, right? Actually it was. My Paternal Grandfather's name was Allen PEEBLES, so was his father AL PEEBLES but my Great Great Grandfather's name was Jim PEEBLES. I figured Jim was to be born maybe around 1850 or so which would of put him in his 20s in 1860. I decided to do a search on Ancestry.com in the 1870 census but was unable to locate the family. Then I thought how many PEEBLES Slaveowners could there be in the County. With a little further research, those were the only PEEBLES that owned Slaves in the County in 1860. J.T. PEEBLES was the only one that owned a 23 year old male in 1860. Could this be Jim?!!! I would say more likely. I did some further searching and found out that J.T. is for James Turner PEEBLES. Jim is short for James. I also found a possible descendant that saved all this information to his tree and has comments about the land that James owned. When I started this journey I was looking for one thing and the Ancestors guided me somewhere else. This happens in our Research, the Ancestors wants their story told and you have to tell it. I have always had pieces of information here and there on my Maternal Line about a possible Slaveowner, but never this definite amount of information. There is just a couple of things left for me to do and that is do some further research on James and the area that he lived and then I will be ready to contact that Descendant and see if he is willing to share. On a recent trip home to Chicago this past November, I stopped by my Aunt's home for a visit. 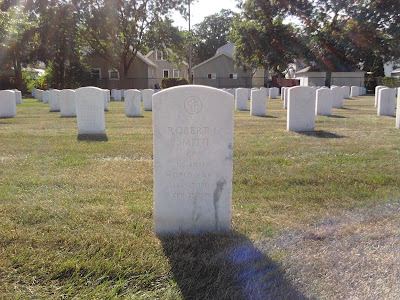 On that visit we discussed my Blog and a little Genealogy. I was talking about my discoveries and she gave me the correct spelling of my Paternal Grandfather's name and she also gave me the name of my Paternal Great Grandmother: Maggie Wallace. I tucked the name away and promised to look into things when I got back home to Maryland. Of course life got in the way and I did not revisit the name until this past Tuesday. Since the 1940s Census has been fully indexed, I decided to do some snooping around on Ancestry.com I remembered the name that my Aunt gave me(Maggie Wallace) and decided to look her up in the Census and there she was in 1940s living with her second husband John Wallace and my Paternal Grandfather was living in the home as well. My Paternal Grandfather's name is Allen Peebles. He was born abt 1908 in Mooresville, Limestone, Alabama to Allen Peebles and Maggie(no surname yet). Allen had 2 siblings John H Peebles born abt 1909 and Lizzie Peebles born abt 1906. I have no further information on John and Lizzie as of yet. I do know from the 1930 census the Peebles family was living in Illinios. John had married someone named Maggie and had a daughter named Juanita. Allen and his mom Maggie was living the household as well. I found an Ohio death record for John looks like he passed away June, 28, 1986 in Dayton, Montgomery, Ohio. I'm wondering did Maggie and Juanita move to Ohio with him?!!! I was able to Locate a Death Record for Allen Peebles. He passed away April 12, 1954 in Illinois. Maggie Wallace passed away March 1974 in Illinois as well. My biggest discovery was a Death Record that I found for my Paternal Great Grandfather(Allen's father) who passed away Febuary 13, 1930 in Alabama. It has his father's name listed as Jim(could be short for James) Peebles and his mom was listed as Louisa(no surname yet). This further grows my Peebles line. Now with all these discoveries, I have more questions than answers. When I mentioned that my paternal Grandfather Allen was living in the household with his mom in the 1940s Census, there was a Georgia Peebles in the home listed as stepdaughter to the head of household and a 2 year old named Alma Peebles listed as granddaughter to the head of household. Could this be Allen's wife and daughter?!! Probably so. I'm hoping that this post leads to some Peebles/Wallace descendants that might be still out there. This would be huge for my family. If there are, Speak Up, us Mathises would love to meet you. Wow!! So hard to believe 10 years has passed and I remember this day as if it was yesterday! September 11, 2001. My day had just began like any other day processing claims and answering calls from members and providers. Suddenly one of my co-workers shouted "A plane just crashed into the twin towers in NY. At first like everyone else I thought this was just a bad accident, but when the second plane hit, I knew it was much more. My next thought was of my cousin Tasha, she worked and lived in NY at that time, but I didn't know where.I tried to contact my mom, but by her being a school teacher that was impossible and plus all the phone lines were jammed. By this time the third plane had hit the Pentagon. WOW! Now its close to home. I never knew that America was so HATED that someone would take innocent lives. See thats when I start really paying attention to what was going on around me. I never been that person to judge, but you really have to ask yourself, "What did we do"? As I sit here and write this blog, I still can't believe something like that happened in my lifetime and after 10 years and 2 Wars, I can say we finally caught the one that was responsible for such a senseless tragedy. I recently had the pleasure of meeting a new "Cousin" through Ancestry.com. Our connection comes from our "Brown" Ancestors. My GG Grandmother name was Norah Brown. Born to Maurice and Anna Brown. She married Orange Granberry and had my Great Grandmother Miranda. Norah passed away sometime after 1900 and before 1910 because I could not find her in the census after 1900, plus in 1917 Orange married Jennie Hegwood. My MoM told me that her Father always spoke of being raised by his Grandmother, but I'm pretty sure it was not Norah because in 1910 he was in the household with his MoM and in 1920 he was in the household with Jennie and his Sister Paula because Orange had passed away by then. I just stumbled upon Maurice and Anna (referred to as "Anika" in the 1870 census, but could be just a spelling/handwriting error) Brown just recently. My great-great-grandmother Anna is your great-great-grandmother Norah's (spelled "Nora" in the 1880 census) older sister. I also confirm that they have a younger sister named Mary. I haven't done much research on Maurice/Anna's children and their decendants yet, so you have provided me with more info -- thank you! So as you can see we both have as much information as the other. I'm also assuming that Anna named a child after her thats how our GG Grandmothers were Sisters. Did my Grandfather know of this side and never talk about them or did Orange keep them away? I plan to keep in contact with this Cousin and work with her to find out as much information as we can. One answer leads to more questions and even when we find that new found Descedant it always leads to more questions. This is where the Ancestors have guided me so I will continue my Research along this Family line. I will keep everyone posted. Thanks for listening. The story that I was given was that my mom was friends with my Aunt Mildred first. They met in school and once they became really good friends she decided to introduce my mom to her brother, my dad Allen Mickey Mathis. 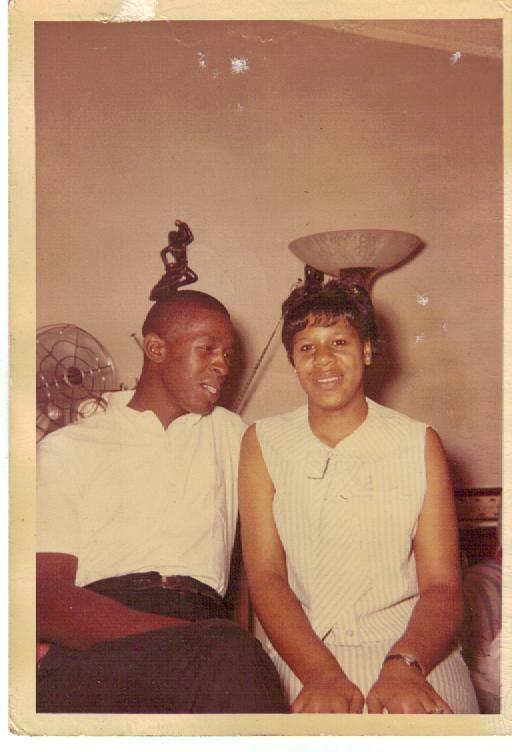 Here they are on their wedding day July 26, 1964, four months after my brother was born. Hmmmm I'm going to ask my mom about that one, but anyway as they say the rest is history. Thanks for listening.